Acquired from the above by the present owner circa 1960. Los Angeles, Esther Robles Gallery, Karel Appel, May 1961. In this work, Le petit garçon, dated 1950, one can see quite clearly the child as an iconographic theme, recurring often in Appel's oeuvre. It is in this identification with children's art and with the state of childhood, that marked the desire to highlight the salient points of childhood through his art. Although Karel Appel is quoted as saying "Art must be violent", this is with reference to the free madness of artist and his primitive forces: matter, paint, brushes and canvas. 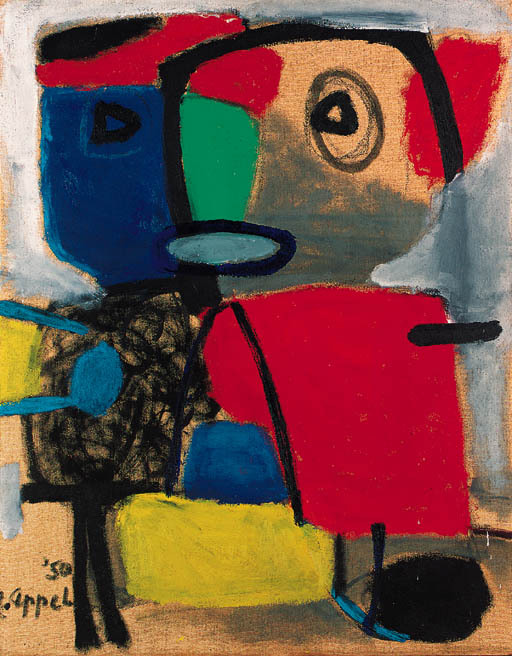 In control of these elements, Karel Appel brings vitality, spontaneity and simplicity and, above all, colour to his work. Being first and foremost a colourist, Appel's paintings - especially those between 1947-1951 - are amazingly rich in expression and technique. He used ochre's, bright yellows, greens and blues, all of which go together to create a veritable child's fantasy playland. As Karel Appel believes, a painting is, after all, a flat surface. You stand in front of it, your imagination has to work with it, otherwise it remains a flat surface filled with colours. In Le petit garçon, our imagination is given free rein to draw from it that which we will. "In modern art I feel closest to Van Gogh, to the vehemence of his emotions and to his revolutionary spirit. When he paints the blue of the sky, this isn't the blue that the eye sees, it's bluer than the blue of the sky, it's the blue of his emotion. He, too, showed us something of life's secret. I like the directness of expressionistic painting. This inspires me more than the other line which runs through the Dutch tradition, I mean the one from Vermeer to Mondrian, I seek the human side of things, the side of life". (Karel Appel quoted in Appel, Fuji Televison Gallery, Japan, 1989, p. 12).